Cauliflower is in season this time of year so it is often on sale around here now, making it a good time to get some if you like it. I have to admit, I like cauliflower, but I often find it quite bland as far as taste. it is one of Michelle’s favorite vegetables, so I thought I would get some fresh cauliflower while it was a good price but I wanted to do something with it that would really bring out some flavor in the dish. I came across this recipe from Williams-Sonoma for a caramelized cauliflower with honey and smoked paprika to really punch up the flavor some. In a large fry pan or skillet set over medium heat, warm 2 tablespoons of the olive oil and melt the butter. Add the cauliflower florets, sprinkle them with a generous pinch of salt and toss the florets to gently coat them with the oil and butter mixture. Spread the florets into a single layer and cook, without stirring the cauliflower, until the undersides are lightly browned, about 3 to 4 minutes. Flip each cauliflower piece over and continue cooking, undisturbed, until each piece is evenly browned, about another 3 to 4 minutes. 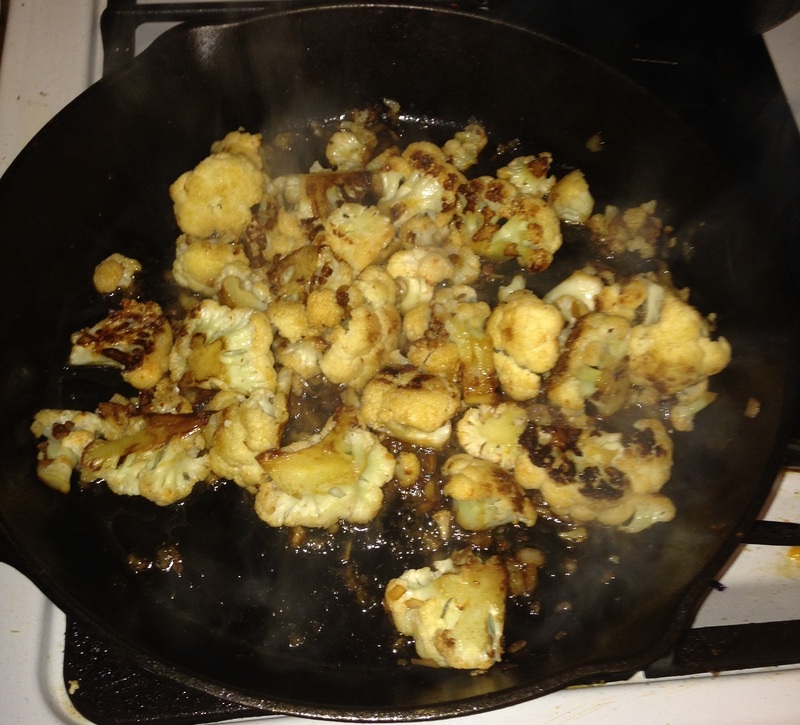 Repeat the process until all sides of the cauliflower florets are evenly browned, about another 3 to 5 minutes more. Add the remaining 1 tablespoon of olive oil, the shallot, the red pepper flakes and the smoked paprika to the pan. Cook, stirring occasionally, until the shallot is softened, about 2 to 3 minutes. Add the honey and the water and saute until the liquid reduces to a glaze, about 2 to 3 minutes. Squeeze the juice of the half a lemon over the cauliflower, stir the vegetables to combine them well and cook them for 30 seconds. Remove the pan from the heat. Taste the vegetables and adjust the seasonings with salt and pepper as appropriate. Transfer the cauliflower to a warmed bowl and serve immediately. It is a very easy side dish to make and tastes great with the paprika, pepper flakes and the honey glaze on the cauliflower. In my opinion it gives the cauliflower a lot more flavor than it ever had before without having to smother it in cheese and it just uses a few simple ingredients. I will surely remember this one again as it gives a nice option for a vegetable we do not have that often. That’s all I have for today. Check back tomorrow for another recipe. I have a few new ones I have tried recently, including a new ribs recipe and some things we made for Mardi Gras, including gumbo, red rice, sweet potato cornbread and banana’s Foster parfaits. It was all pretty delicious and I think you will like them. until next time, enjoy the rest of your day and enjoy your meal!